Each year, we anticipate the award-giving bodies in Hollywood as they announce the year's nominees in all categories. Do we know enough about the Hollywood’s grandest trophies? Here are Fun Facts about the awards season’s most prestigious icons. The awards season will soon be in full throttle and it won’t be long before the red carpet rolls out for the luminaries of Hollywood’s music, film, and television scenes. There are a lot of things we watch out for as the countdown begins to some of Hollywood’s brightest nights: the Golden Globe Awards, People’s Choice Awards, and the Screen Actors Guild (SAG) Awards ceremonies. While we wait to have a glimpse of the best celebrity outfits, the most gorgeous celebrity couples, and the most stirring acceptance speeches, it is the fervent hope of the night’s nominees to bring home symbols of dramatic milestones for their careers. While the guesses keep coming in as to who will emerge most triumphant this awards season, we take a look at the precious mementos that the nights’ nominees hope to win. 1. 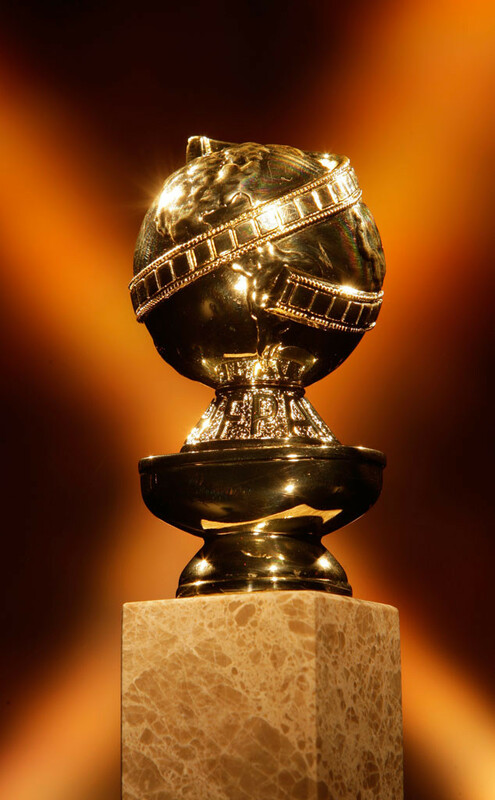 The Golden Globe Awards have been around since 1944 but the Globe’s design—a globe wrapped in film—was only decided a year later in 1945. In 2009, the Hollywood Foreign Press Association gave the Golden Globe a make-over. The 5.5-pound, 10.75-inch statuette now has a new marble base and a 24 karat gold plated zinc die cast top. 2. Aside from the statuette, winners of the Golden Globe also receive a red velvet lined, leather bound chest with HFPA logo stamped in gold. 3. Meryl Streep has eight (8) Golden Globe wins and 30 nominations, a feat that no other actor has surpassed. If honorary awards are included, Barbra Streisand holds the record of having the most Golden Globes. The singer-songwriter turned actress and filmmaker has nine (9) Golden Globe wins. 4. Waterford Crystal, the designer of the People’s Choice Award trophies, is an Irish company that closed down in 2009 and re-emerged later that same year after several difficulties and take-overs. The crystal manufacturer inked the deal with the People’s Choice Awards in 2010. Aside from the People’s Choice Awards trophy, Waterford Crystal also designed sporting trophies, including the winning trophies French and German Grand Prix in Formula One. 5. 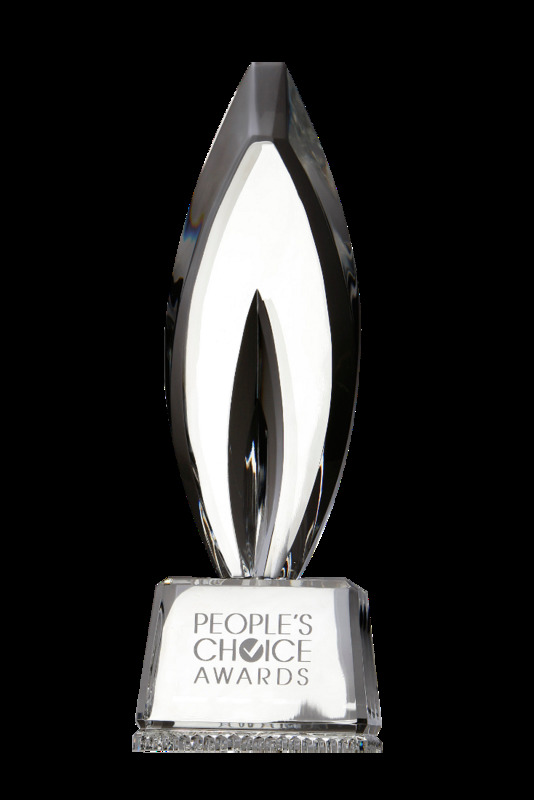 The 10-pound, 14-inch high trophy for the People’s Choice Awards. The trophy’s small upright cuts on the base create light refraction, which are signature designs by Waterford Crystal. The thickness and clarity of the crystals used in the trophy is evident in the top part of the award, which includes large center cuts on both sides of the award. 6. 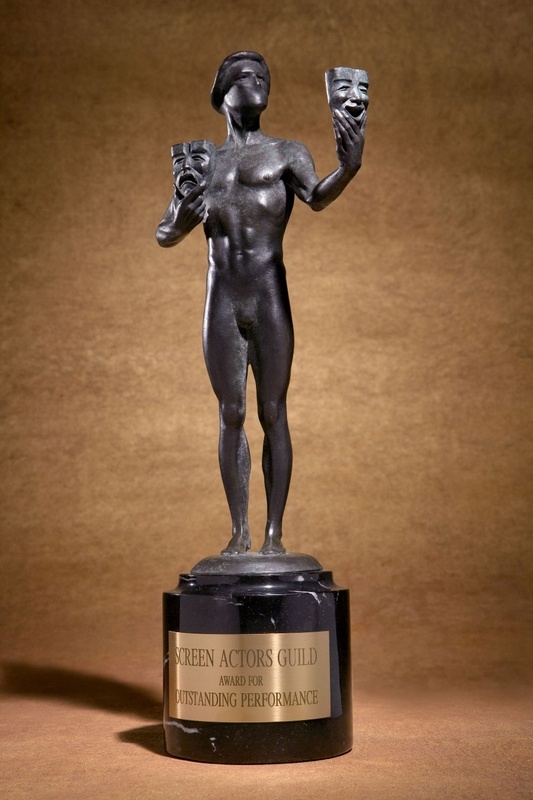 The 16-inch, 12-pound trophy of the Screen Actors Guild Awards, called the Actor, is famous for its pose they do not start out with arms upon their creation. When the trophies are made, a mother mold made with silicon is used to create the wax, which might break off when it is pulled off from the mold. To prevent this from happening and to achieve the famous pose, the arms are attached separately instead. 7. The task of creating the statuettes for the Screen Actors Guild Awards falls to the American Fine Arts Foundry in Burbank, California, which specializes in bronze art foundry and sculpture fabrication for artists. To date, the Foundry has produced more than 1,000 Actors, 952 of which have been awarded since 1995. 8. In 2015, a 10-foot, 200-pound replica of the Actor made an appearance at the Hollywood sign in Los Angeles. It turns out that the Actor made a detour while on its way to the Shrine Exposition Center. The stop-over started a new SAG tradition and everyone is now on the look-out for the Actor’s next destination. Now whose homes will these trophies adorn this January? All three awards ceremonies air LIVE from the US first and exclusive on RTL CBS Entertainment. 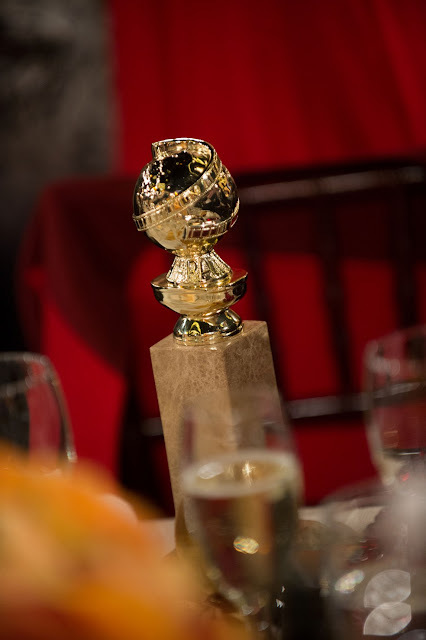 The Golden Globe Awards ceremony aired last January 9, 8AM, the People’s Choice Awards on January 19, 10AM and the SAG Awards on January 30, 9AM.